Originally conceived as a personal playground for Utah Jazz owner Larry Miller, Utah Motorsports Campus (former Miller Motorsports Park) has instead become a thriving center for motorsports of all kinds. Opened in 2005, the facility includes a kart/autocross track, as well as a main circuit that can be used in four possible configurations, with the East and West Circuits capable of being operated simultaneously. The full circuit is a sprawling 4.5 mile course with 23 turns, but the Outer Loop is favored for professional events. Navigating the 23 turn maze is duanting, but every corner is important in carving the quickest lap. For the first few turns, the biggest difference in the racing line between vehicles is for the Motorcycle, which hardly drives out at all after exiting Turn 1. Turn 2 works best with an early apex for all vehicles. The apex at Turn 3 is pretty central, and Scream can be taken at or near full throttle by most vehicles. Coming down into the hairpin, Al has the motorcycle hitting the curbing at both apexes. The Miata runs widest after the first apex, but the Porsche ends up with the widest overall exit. 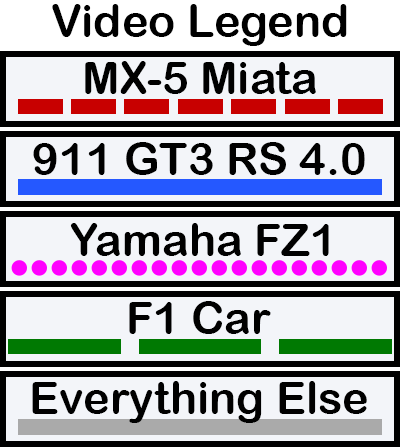 Many Miata drivers in online footage will run even wider after the first apex, taking something more like the F1 line. Video of pilots following Al's line through Turn 6 are almost non-existent. Having ridden this track, I can agree that the temptation to enter wide at Right Hook is great, but it doesn't appear to lend any advantage. The Miata can be a bit wider than the Porsche, but not by much. After that is Turn 7, where you should let your speed carry you out after the first apex, skip the fool's apex, and tighten the turn slightly to hit the second apex. Drive straight to the apex at Turn 8, and apex early. This turn creates "Indecision" largely because if you take it like a normal turn, you won't end up needing the full track on the exit. Don't be tempted to enter wide at Precision, either. Turn 11 can be taken at over 100 MPH by anyone not running wimpy street tires. The key to Gotcha that is underused by most drivers is to take is faster than expected and exit wide, running almost to the right edge of the track. Once you get to Turn 15, take both apexes, getting to mid-track or slightly farther in between. This brings us to the Attitudes. Most drivers exit Bad Attitude too slow and don't end up needing the whole track for their exit. Club House Corner requires a similar approach to Gotcha, but even more so, driving all the way to the curb on the exit before sneaking back to mid-track or less for entry into Turn 22. At Turn 23, the high powered vehicles take a small double apex, which can also be treated as sticking the inside the whole way around. Depending on the optimization, the Miata will either follow that approach or stay farther right after exiting Wind Up in order to enter 23 slightly wide and take a late apex. Fingernail inspections are then in order as you make your way down 900 foot front straight. Try to ignore the cones on the course. They detract from the "flow." Fairly docile riding in this vid, but I do love hearing that R1 sing down the main straight. Careful about that fool's apex at Turn 7.